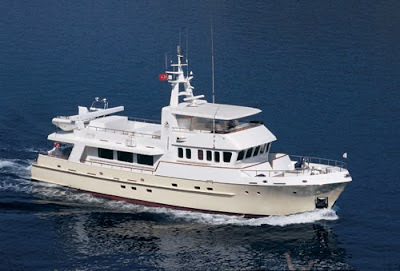 Motor Yacht TIVOLI 90' luxury expedition yacht sleeps 6 in 3 cabins with marble baths. Long time Co-Captain Trevor Marston and Chef Caren Sharpen are eager to share the beauty of Waikiki, Molokai and Lanai highlighting a very doable 7 day/3 island itinerary. Horseback riding tours available. $55,000/6 plus all expenses. Open for Christmas and New Year's. Three staterooms with individual controls for lighting, air conditioning and heat; ensuite bathrooms have programmable water temperature settings and European brass fixtures. Two staterooms with twin beds with enclosed marble showers. Master stateroom with queen-size bed, settee, dressing table & two wardrobes, 2 heads, one with marble shower and one with steam show plus whirlpool.Spiral staircases, rich mahogany raised paneling. Saloon with large couches, Bose entertainment center, bar, wine cooler. TIVOLI can accommodate 6 guests in 3 cabins. Three staterooms radiate from a central foyer. The master stateroom has a centerline queen bed and separate his ‘n hers baths, one with a marble shower and one with a steam shower plus whirlpool tub. Two guest staterooms have twin lower singles and enclosed marble showers in the en suite baths. TIVOLI is fully air conditioned through out. Crew has a separate companionway, heads and shower.